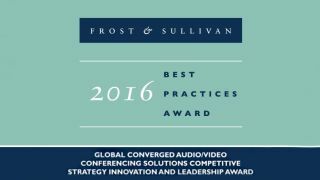 ClearOne is being recognized with the 2017 Frost & Sullivan Award for converged audio and videoconferencing, competitive strategy innovation, and leadership. The recognition stems from Frost & Sullivan’s ongoing analysis of the unified communications and collaboration market, which cites ClearOne’s video collaboration product and services portfolio for its ability to cater to businesses of varying sizes, industries, and technology requirements with a high degree of customization. Each year, Frost & Sullivan presents this award to a company that has developed a comprehensive product line that caters to the breadth of the market it serves. The award recognizes the extent to which the product line meets customer base demands, the overall impact it has in terms of customer value, as well as increased market share. “ClearOne is leveraging its long track record and experience in the industry to hone its audio portfolio and build up advanced features and functionalities in order to more effectively accommodate evolving customer needs in video solutions,” said Frost & Sullivan analyst Vaishno Devi Srinivasan. According to the Frost & Sullivan award citation, while many vendors now acknowledge the opportunities arising from growing demand for video collaboration and cloud video services, there are few that offer a tight integration between audio and video endpoints and cloud video services. ClearOne’s ability to deliver this tight audio and video integration gives it an edge over many competing conferencing vendors and the value customers demand.